Our daughter K. worked for a National specialty food market 4 years ago and while there, she was able to get a flat of strawberries with her employee discount. Since she and I love strawberries, she decided to make strawberry leathers, cupcakes, smoothies, pancakes and a sauce for ice cream. She and I were in strawberry heaven. However, after we both ate some of the finished treats, the fun began. K.’s face blew up, turned bright red, the hives arrived all over her body, and she was very ill. We gave her antihistamine pills as she didn’t want to go to the ER. And that was the end of the strawberries for her. 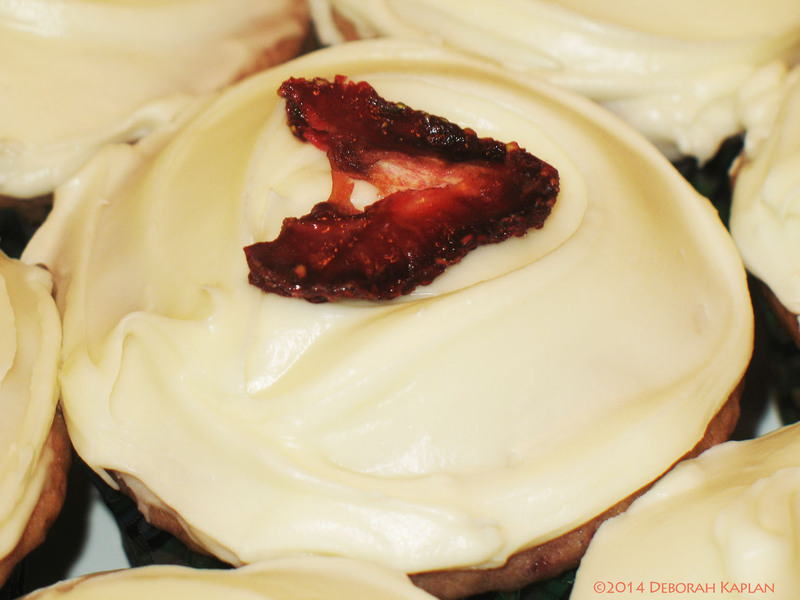 Once she was feeling better, she gave the cupcakes away, as well as the leathers and sauce. When she was a child, occasionally one side of her nose would swell up in the late Spring time, but we never knew why? A year later, she decided to try just one little strawberry, to see if indeed it was the strawberries that she was allergic to. Oh Yes! Definitely! She turned bright red, hives, and sick to her stomach. Well that was the final time. Just recently, she and a friend were having beers at a Delaware venue, when the friend noticed the bottle of beer that K. had ordered had a picture of a strawberry on the label, so they quickly switched the beers and all was good. Clean the strawberries and remove the stem. Slice strawberries into uniform 1/4 – 3/8 inch thick slices. (You can use a Mandolin, although I don’t use it, as I value my fingers too much). 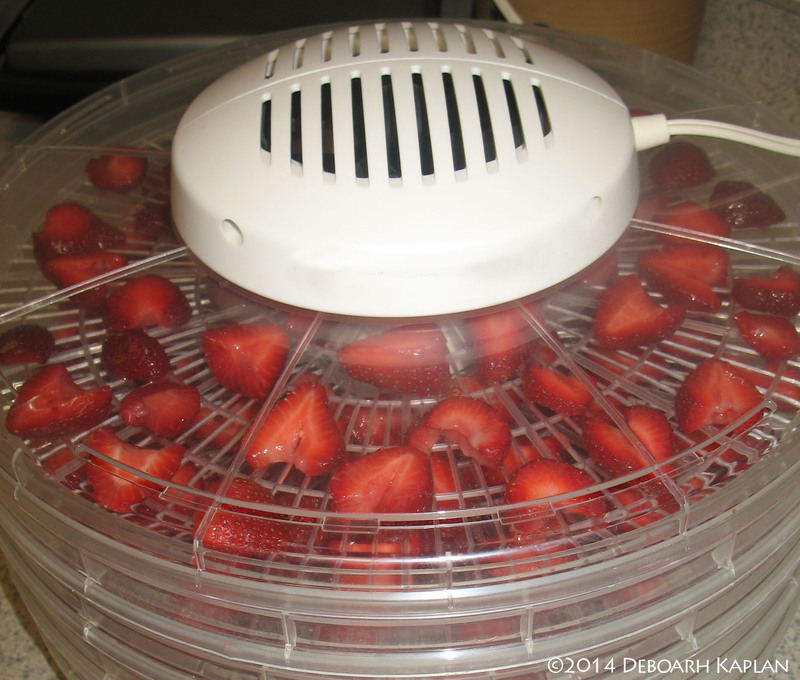 Place strawberry pieces on racks of dehydrator. Optional: Paint each piece with honey on top side. My dehydrator has only one speed, so with that said, I dehydrate the strawberries for 6-8 hours and check them for any moisture. If moisture is present then they need to go back in the dehydrator. I also have found that the ones at the bottom take longer as they are away from the motor drier. When they are finished drying, then let them cool. We store them in resealable plastic bags for easy access, in the refrigerator. Yield: 1 Pint (Depends on how large strawberries are).